1 Solid Stamp + 1 Line Stamp = 3rd Stamp Design! Solid shapes are fairly common stamp designs. Their broad areas of rubber invite all kinds of interesting coloring opportunities. But one of the things that is so cool about solid stamps is that you can combine them with line stamps to create an almost endless number of new stamp impressions. These three heart stamps are fairly typical solid stamps. They are all basically a broad smooth expanse of rubber cut into a heart shape. Two have a cutout detail, but mostly it is solid rubber. Ink one up with an inkpad, paint or watercolor markers and you get a solid heart image in one or more colors. But look what happens when you combine it with a line stamp! This is an easy technique. 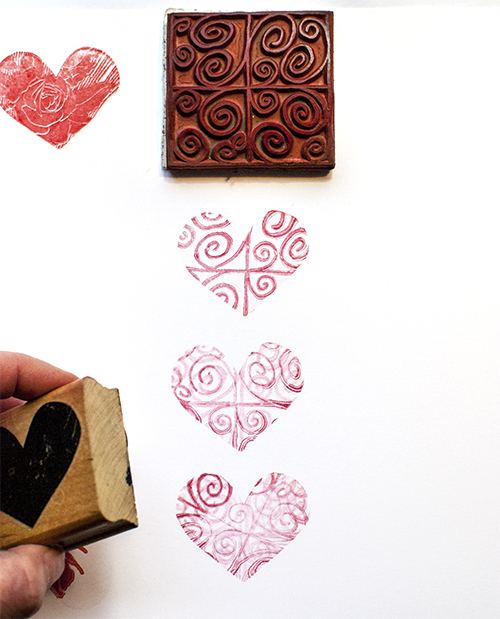 If you have been stamping for a while, you probably already know it . . . but you may have forgotten about it or might not have thought about using it in exactly this way. 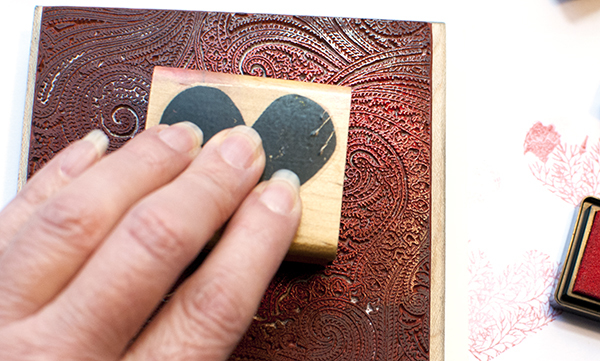 Press a clean un-inked solid stamp onto the inked line stamp to transfer the inked pattern to the solid stamp. Huff on the now inked solid stamp to give it a little extra moisture and then stamp the patterned shape onto your paper. If the ink on the lined stamp is very wet, you can probably repeat this process without re-inking. 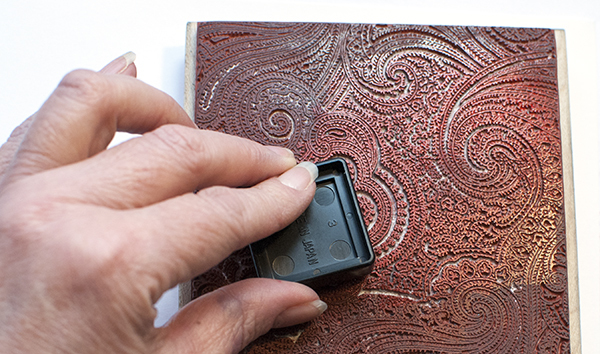 Simply add an extra huff on the solid stamp before you press it into the inky lined stamp again and repeat the rest of the process. Unless you are looking for a very clean patterned image, you can often skip cleaning the solid stamp between re-inkings. By doing this, and maybe even inking the stamp using a different area of the patterned line image, you can sometimes build more complex patterns as a lighter version of the original lined pattern is combined with the new darker lined pattern in the new print. Here I used the same solid heart stamp with a different patterned stamp. 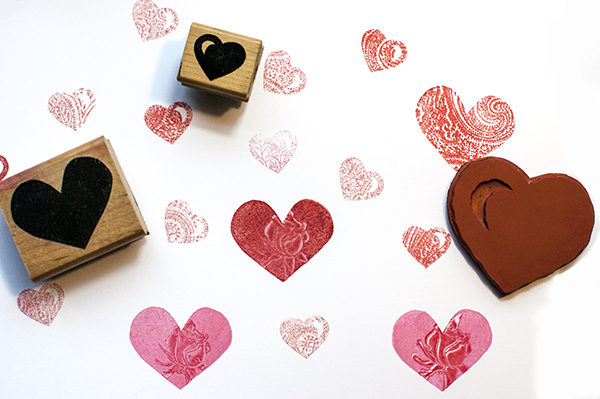 The first stamped heart is the first inking. Then I huffed on the solid heart and repeated the process, turning the solid stamp ninety degrees on the lined stamp to get the second stamping. I did this again, this time pressing the solid stamp on the lined stamp at a diagonal angle to get the third stamping. See how each successive stamping gets more densely lined, with more variation in color strength? This is as easy technique, but you’ll want to pick the right ink for the best results. This isn’t the time for inks that dry very quickly, so reach for water-based inks rather than more permanent solvent or oil-based inks. You could try hybrid inks but you may find that some dry too fast. For my play today, I used juicy regular dye-based pigment inkpads for bold colored impressions and Distress dye-based inkpads for more muted color. Basically you need an ink that can be used to ink one stamp, can then be transferred to another and then stamped on paper. It has to be wet enough to make that extra step along the way. If it is too dry, then the final stamped impression will be very light or won’t work at all. The solid stamp can be whatever shape you like. I’m using heart shapes today because Valentine’s Day is coming up, but you can do this with solid circles, rectangles and other solid shapes. You might also have stamps that have both solid and patterned areas. Play around with these and see what happens. Keep in mind that the solid stamp’s purpose is to limit the lined stamp’s design to the shape of the solid stamp. To do this effectively, you usually want the lined stamp to be bigger than the solid stamp so that there is room for the lined image to completely fill the solid image. You could repeatedly stamp a lined image onto the solid image or use more than one patterned image to fill out the solid image’s space, but picking a solid stamp that is smaller than the area you plan to use of the lined stamp is simpler and quicker. The lined stamp could be a background pattern or it could be a more defined object like a flower or a face. In order to see the solid stamp’s shape in the final image, you’ll want to pick a lined stamp that has enough detail to fill out the solid stamp’s shape. 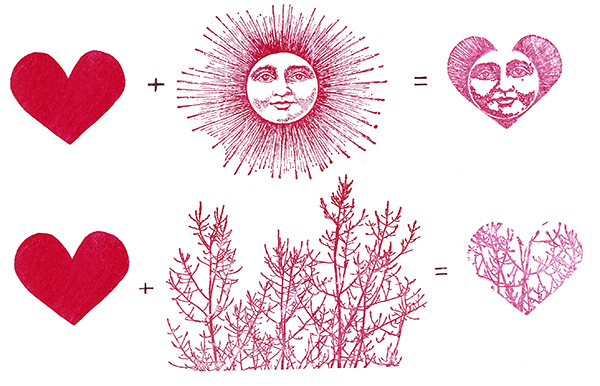 For example, this long-stemmed rose is lovely on it’s own, but if I try to stamp it inside the heart using this method, the heart’s V cuts into the rose flower and you really can’t see the heart shape at all. 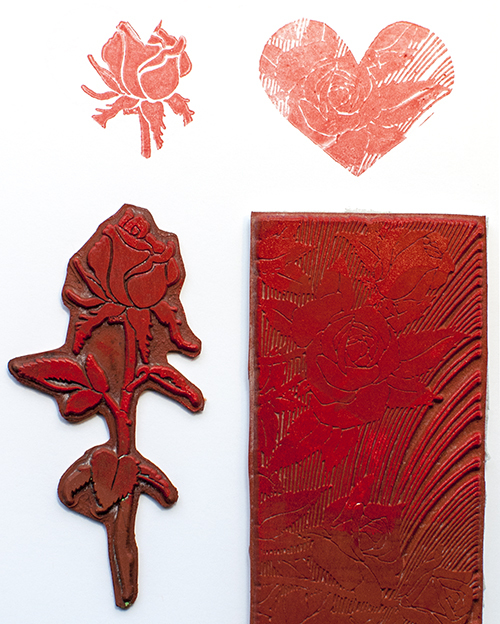 (You could instead try inking the solid stamp with a different color first and then proceeding with the technique; that would give you the heart shape but still might cut into the rose.) The rose background on the right, on the other hand, fills the whole heart shape and so works better with this technique. Unless you want backwards letters, avoid text stamps. Text stamps start with backwards letters on the stamp. They turn forwards with the first stamping on the solid stamp but then get turned backwards again when you then stamp the image on the paper. You may be surprised at the lined stamps that can work for this, especially if your solid stamp is small. You might for example have a stamp of a zebra where you could transfer the pattern of the zebra’s coat to the solid stamp. Or maybe you have a stamp of a field of small flowers that would be fun on the solid stamp. Or how about tree branches or grasses? You can find interesting patterns in all kinds of stamps. 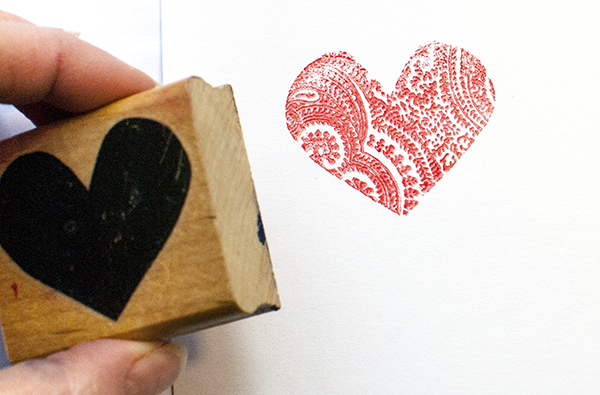 Look at your lined stamps with a new eye to see how just a small portion of them might be used in this way. Ilove this technique ! Headed for my stamps right now!! A great reminder of how we can combine our stamps!!! You haven’t posted in awhile… I hope everything is ok!! !